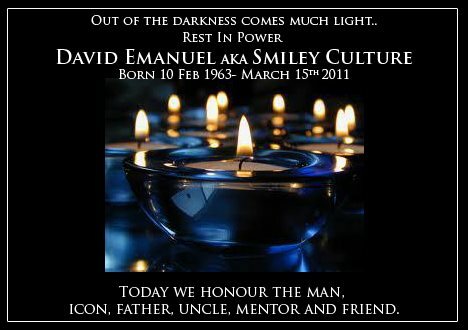 Today we commemorate David Emmanuel, aka singer and entertainer Smiley Culture, who died at the hands of police during a raid at his home in Surrey one year ago. Following Emmanuelâ€™s death police said that Smiley Culture had stabbed himself in the heart and had died from that single stab wound in the kitchen of his home, after he had asked officers if he could go and make a cup of tea. The Â Independent Police Complaints Commission (IPCC) subsequently conducted an investigation into Emmanuel’s death. The Guardian reported in November 2011 that the summary of the IPCCâ€™s final report â€“ the coroner has asked that the full report is not made public or shared with Emmanuel’s family â€“ condemned the raid as significantly flawed and compels the MPS to overhaul the way they plan and execute future drug seizures. But the report concluded there was no evidence to justify bringing criminal charges to the police officers involved in the raid. None of the officers involved have been suspended, and the IPCC treated them as witnesses, not as suspects, which means they were never formally interviewed. “They promised us a thorough investigation and that they would get to the bottom of what happened. But there are still so many unanswered questions â€“ and the IPCC have now made sure that the officers who saw what happened are never going to be pressed to tell the truth about what happened that day,” Merlin said. An inquest will be held into the reggae singerâ€™s death. Today we commemorate and remember Smiley Culture, and all those who have died needlessly in police custody.